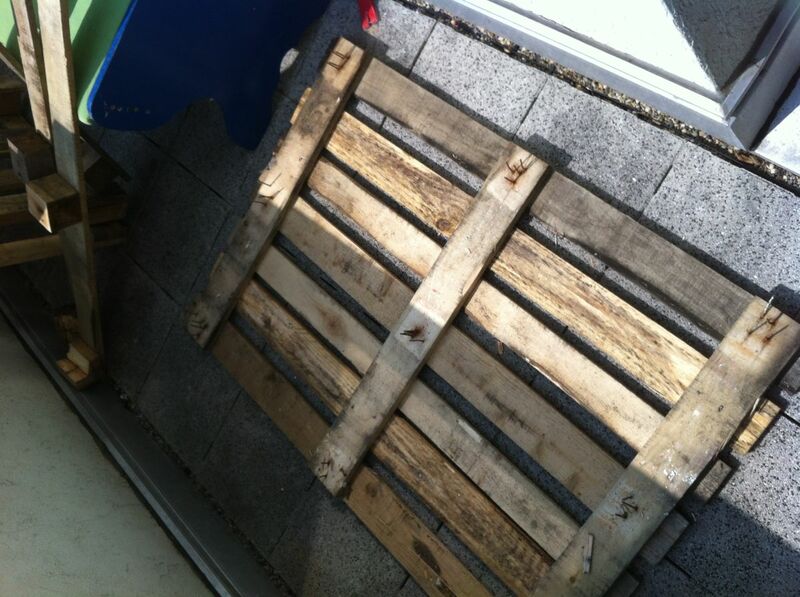 The following needs not necessarily to be built with pallets, neither are pallets sufficient for its creation. The occasion for its construction were the really nice drawers i had as a leftover from a cupboard which reached its final destination while my last move to the new flat. I had to throw out most cupboard parts, but kept the shelves for being quite noce wood and looking useable, and of course the drawers, which i really like. 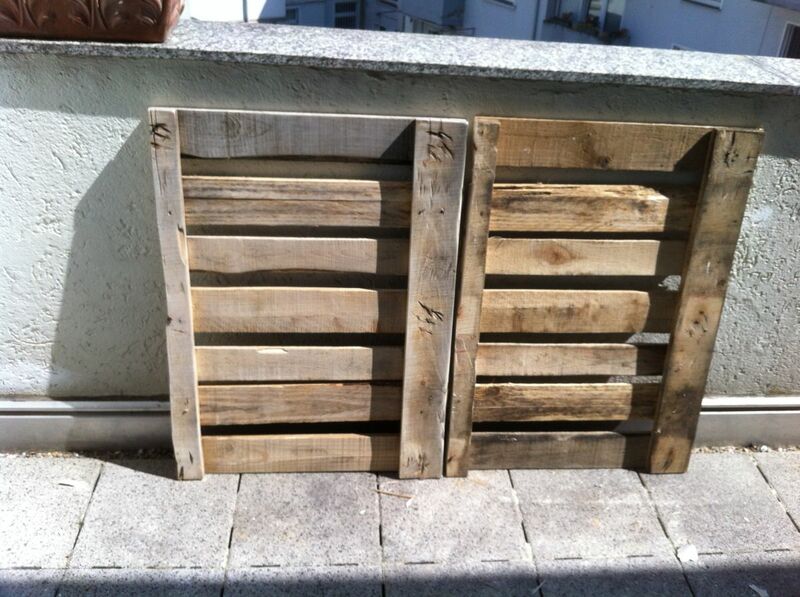 And hey, I always build my stuff with pallets, so why not here? 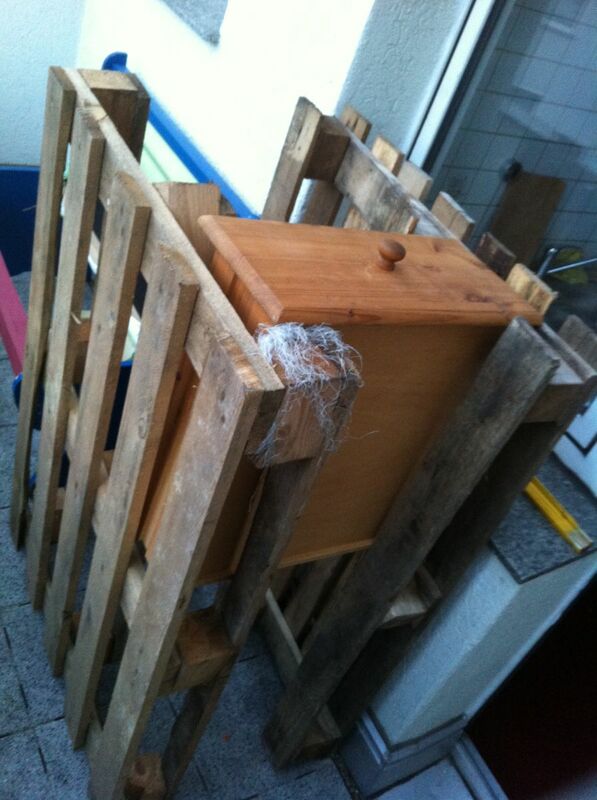 The idea: Pallets as the sideboards of the cupboard, drawers on the pallet legs acting as the “rails” the drawers are placed upon. It came out totally different (as it sometimes happens), but the early plan still looks like an interesting option. Measuring pallet and drawer height, it became clear that this plan would result in a poor use of space – even if gaps between the drawers still would be an option, especially because of the opportunity to put stuff in the drawers higher as the drawers themselves are. 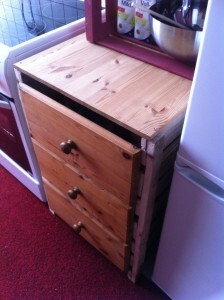 But hey, i wanted a cabinet with three drawers instead of the two which would only be possible with the first concept. Well then. 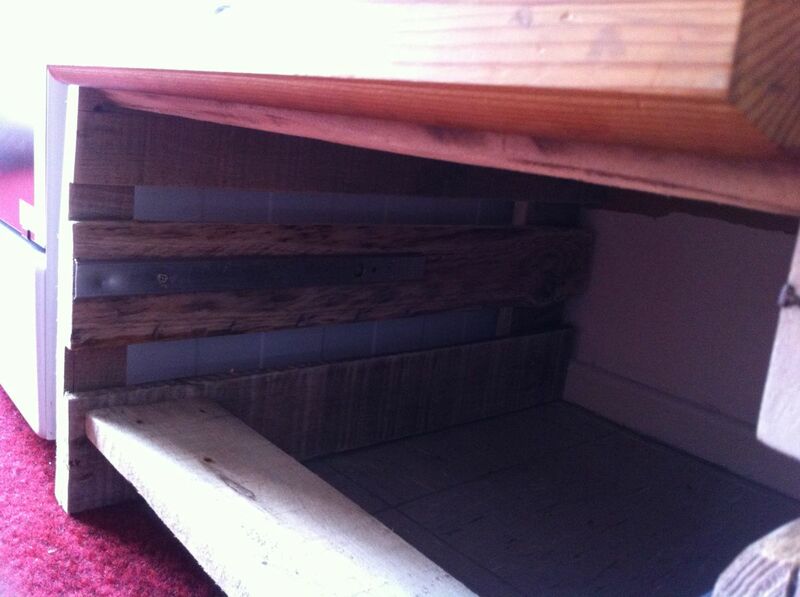 Luckyly i also did keep the metal rails for the drawers from the abandoned cupboard. If you don’t have those, you can simply use thin wood for the drawer sliders. But I’m getting ahead of the actual progress. 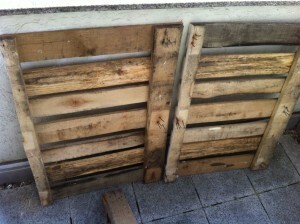 First: you need good, clean pallet sections for the side parts. One pallet was totally sufficient for me here – I removed the “footer parts” completely, cutted the pallet straight in half (through the mittle woodboard) and had my ususal cleaning/grinding/nail removing proceture. Keep the planks of the footer parts, we’ll need those, too. While this is going to be kitchen furniture, maybe you should be even a bit more dilligent at cleaning/grinding, as you usually are. Moreover, consider wood treatment. I’ve now left the wood untreated. Let’s see how it lasts. The following assembly of the resulting kitchen drawer cabinet is quite simple on the one hand, on the other hand its a little notchy. 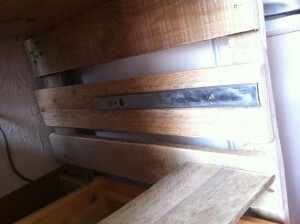 First you’ll need to measure at what distance and how high the drawer guide rails have to be fixed. I had a bit of luck – the placement always fitted with the pallet boards. Then measure the width of the cupboard needed for the drawers. Cut wood boards in corresponding length out of the footer boards you removed ewarlier from the pallet. I screwed directly through the pallet boards into the boards, using them as a stabilizing element below each drawer and as a spacer keeping the right distance for the drawer rails. On top, i used one of the shelves as a work area/cover. This fitted quite OK, again, its up to your taste to use a kitchen workboatrd or other material. Just something thats ok for kitchen use and gives a bit more stability. 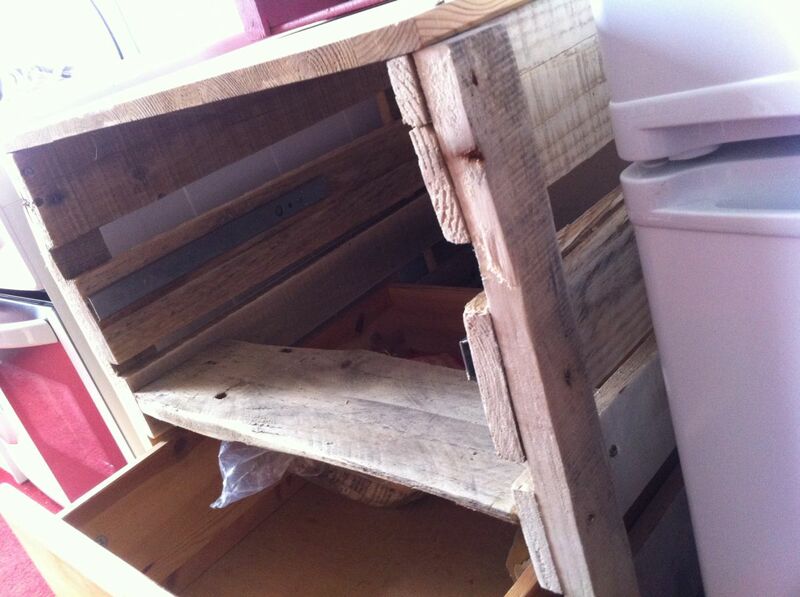 You can also take pallets 😉 but then you may need some cover – it’s a kitchen cabinet, and there’s fat, moisture, whatever, and i think its quite annoying when the chopped vegetables fall through gaps into the kitchen drawers. Drawers in use. Here its crucial to have have measured and worked accurately in advance. 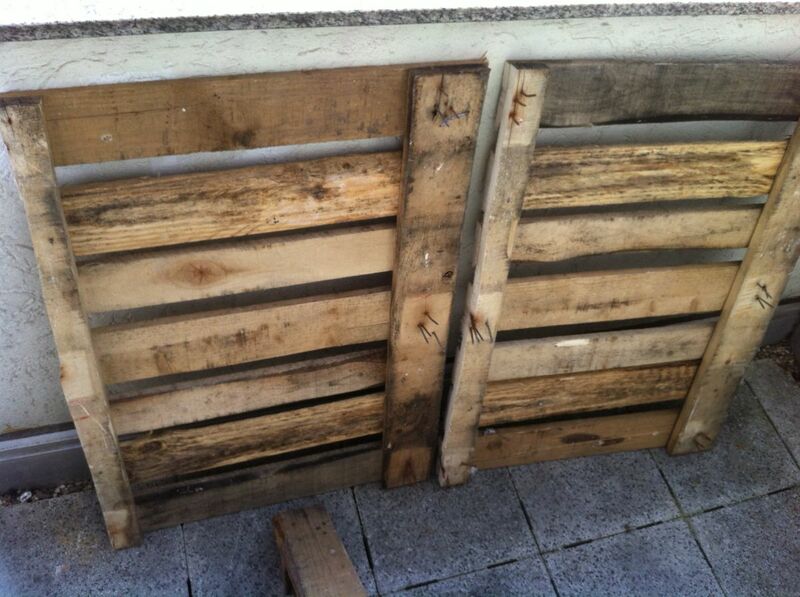 The typical “unprecise” pallet material has its downsides here. I had about half an inch more distance between the drawer rails than the net width of the drawers themselves, so slight warpings in the wood, etc. should not lead to tilting drawers. 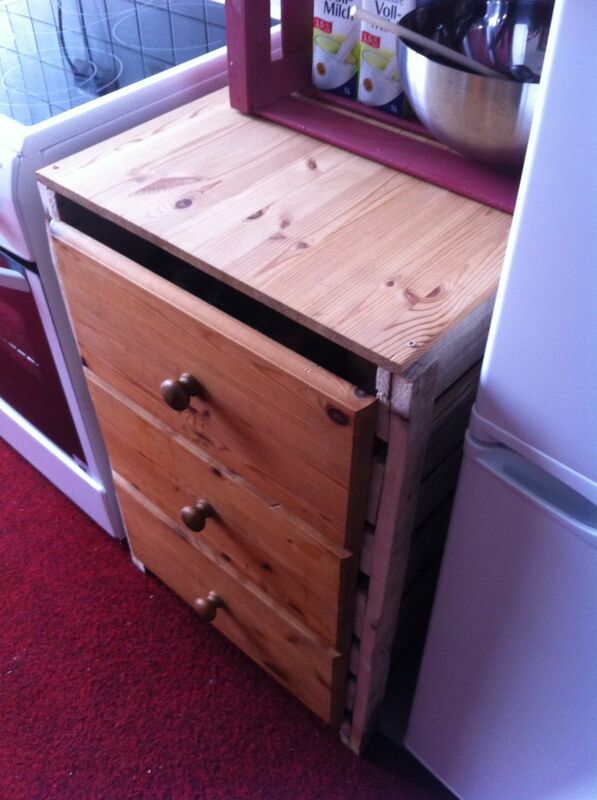 On the other hand, the drawers must not fall off the rails. The latter is hardly possible due to the spacer boards, but still. In this specific case, it worked out just fine because of the tolerance space used, and moreover, the possibly warped palette side elements are somehow “pulled into the right distance” with the spacer boards.